I have a BUNCH of these out there now! I see why they're the state butterfly of NJ. 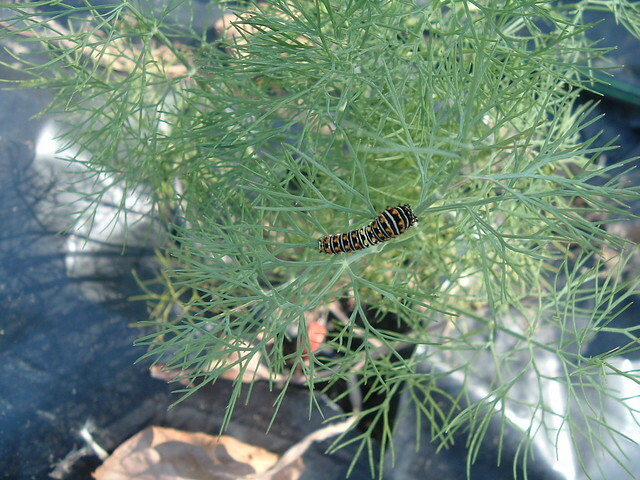 Originally, I thought there were just 3, in my parsley/dill windowsill SIP box on my deck, but I found 6 there today, then, on several dill plants out in the garden, I found at lest 5 more babies. 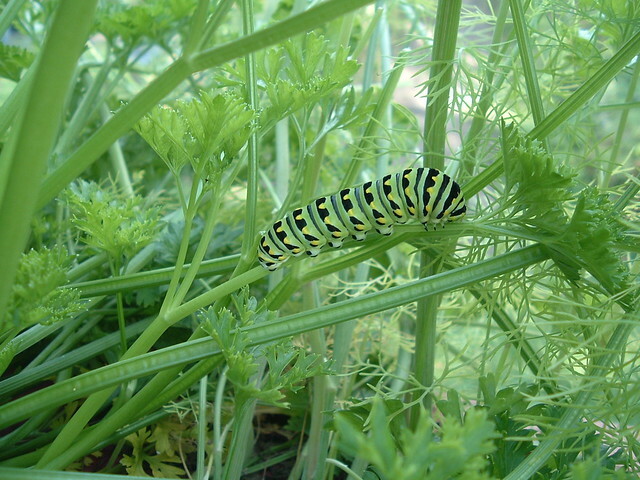 And here's that huge parsley plant, hiding most of the dill, and maybe more caterpillars! I found the 3 more when I trimmed this earlier, removing the yellowed and browned stems underneath. I use parsley, but I can't keep up with this thing! apple, I think I remember you saying that you raise the swallowtails, as well as the monarchs. What should I do with these when they pupate? It seems they are an overwintering variety, but should I put them somewhere a little less harsh, than just leaving them out where they are? I have a few also. 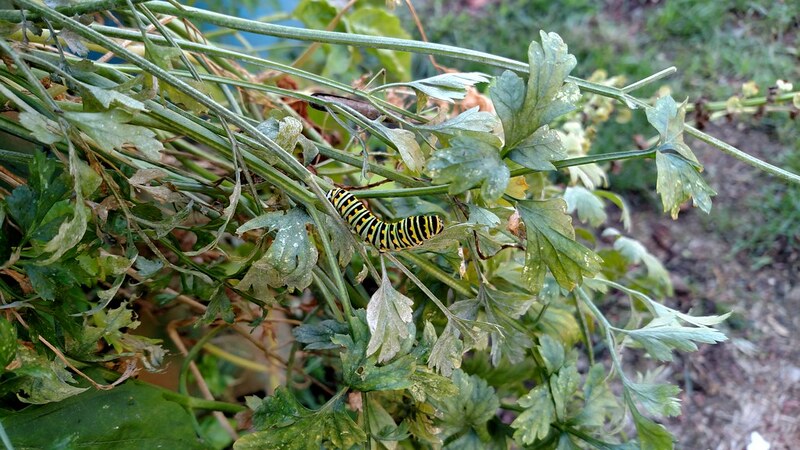 I put out as much parsley as I can for these guys. Try something neat, stroke its back and horns will come out and spray a nasty smelling stuff, my daughter showed me this yesterday. I have been told this might not be correct, but so far, my impression is that green chrysalis will eclose this fall but tan chrysalis will overwinter. In my experience, it is a mistake to bring them all the way indoors because each time we have tried this, they have eclosed some time in mid-February to March, way too early to be let out and no flowers for them either. If you can keep an eye on them, then sheltered unheated porch or carport type of location might work, under the deck, etc. but you may need to protect the chrysalis from mice, spiders, and other nibblers. A hardwarecloth cage maybe? I've kept them successfully in butterfly habitat in the unheated garage where I spend my late winter-spring days looking after cold weather and tomato, etc. seedlings, so I can examine them every day.